Top row from left to right: Jimmy Snaith, David Gibbons, Geoffrey Hurst, Colin Hayward, Nesta Denham, Pamela Early, Shirley Morris, Diane Morgan, Nora Eckersley, Ian Dunford, John Butchers, William (Bill) Booth, Melvyn Ash. Second row from left to right: David Parr, John Legg, Adrian Gentle, Unknown, Keith Gere, David Butchers, Derek Scrase, Barry White, Unknown, Malcolm Baird, Colin Broomhead, Patrick Hall, Ian Carter. 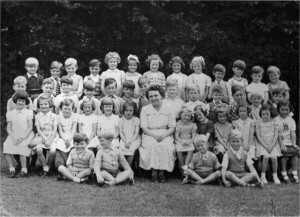 Third Row from left to right: Sandra McCauley, Susan Taylor, Josephine Harris, Pauline Taylor, Avril Crouch, Jean Early, Miss Butchers, Jenny Chessell?, Mavis Groundsell, Nicola Shirlaw, Kathleen Joyner, Tina Lang?, Angela Attrill. Sitting on grass: Martin Hinds, Ivan Day, David Chessell, Robin Hayter. With thanks to John Green who has recently added many names. 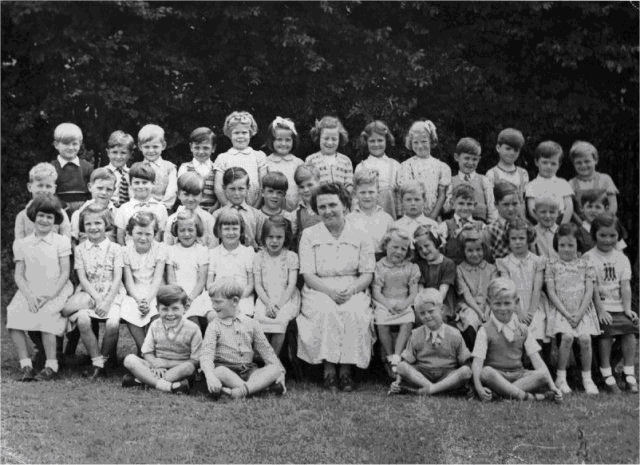 There are now only two unknown names and two “not sures” in the photo – can you help add these final names?